Bromsgrove had a parish workhouse from 1723 located on the Strand. The building, which was built as a private house in 1701, still survives and has now been converted to use as offices. In 1776, it could accommodate up to 100 inmates. 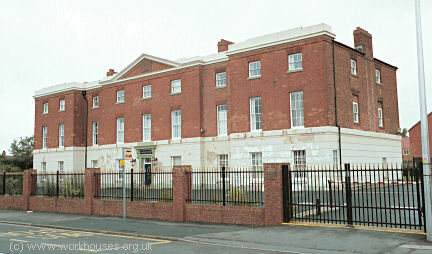 Bromsgrove former parish workhouse, 2006. There were also parish workhouses at Tardebigge, Alvechurch, and Belbroughton. The Belbroughton workhouse from 1824-37 was located at what is now 22-26 Church Hill. The building was later converted to become the New Inn pub, then in 1979 became a restaurant called Freshmans. It has now reverted to residential use. 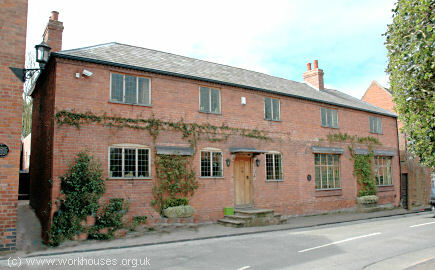 Belbroughton former parish workhouse, 2007. County of Worcester: Alvechurch, Belbroughton, Bromsgrove (5), Cofton Hackett, Frankley, Hagley, Pedmore, Stoke Prior, Tardebigge (3). County of Warwick: Tutnall and Cobley. County of Salop: Hunnington, Romsley. Later Additions: Bentley Pauncefoot (from c.1837), Beoley (from 1911), Grafton Manor (from 1863), North Redditch (from 1894), Redditch (from c.1837), Stoke in Bromsgrove (from 1894), Webheath (from c.1837), Wythall (from 1911). The population falling within the union at the 1831 census had been 19,843 with parishes ranging in size from Hunnington (population 134) to Bromsgrove itself (8,612). The average annual poor-rate expenditure for the period 1834-36 had been £6,333 or 6s.5d. per head. The new Bromsgrove Union had its inaugural meeting on the Tuesday 8th November 1836 at Bromsgrove Town Hall, with the Guardians having their first business meeting on 21st November at the old Bromsgrove parish workhouse. The Guardians decided to inspect the existing parish workhouses in the Union before deciding whether or not to erect a new building. A list of the required workhouse posts and salaries was also drawn up, which included a Master at £40 per annum and a Matron at £20. The Union's full time clerk was to receive £120 per annum. A new Bromsgrove Union workhouse was erected in 1837-8 at the west side of Birmingham Road and received it first admissions in March 1839. The Poor Law Commissioners authorized an expenditure of £5,500 on construction of the building which was to accommodate 300 inmates. The architects were J Bateman and G Drury who also designed other Midlands workhouses at Leek, Birmingham, and Stratford-on-Avon. Their design for Bromsgrove was based on the model cruciform plan published by the Poor Law Commissioners in 1835. The site location and layout are shown on the 1902 map below. The workhouse had a entrance range at the east which contained the porter's lodge, board-room, offices and so on. To the rear, radiating from the central supervisory hub, were four accommodation wings for the various classes of inmate (male/female, old/able-bodied etc.). The areas between the wings were divided in segregated exercise yards. Service and workshop buildings formed the square perimeter of the workhouse. An 1895 plan of the workhouse is shown below (click on the picture to see a larger version). Bromsgrove entrance block from the north-east, 2000. Bromsgrove main block detail, 2000. 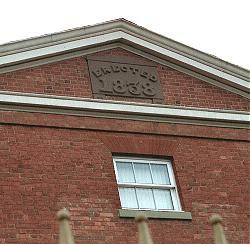 The workhouse was involved in several scandals over the years. In November 1838, two elderly women, Susan Morris and Ann Bunce, were moved into the workhouse. In response to this, a local minister, the Rev G R Gray, launched an attack on the Guardians which virtually accused them of kidnapping the two women. The Board protested that the women were infirm and destitute and had been deserted by their families. Nonetheless, for several weeks Gray conducted a highly public campaign which, regardless of the facts of the matter, seriously hurt the union's image. In January 1842, a five-year inmate named Henry Cartwright died due to the negligence of the Medical Officer, Dr Fletcher. Cartwright, in common with other workhouse inmates was suffering from "the itch" or scabies for which the treatment was a treatment with potassium sulphate. However, it appeared that the boy had died after being immersed in a solution of the compound. Many years later, in January 1899, the death of another young inmate, six-year-old Sarah Jane Ward, brought shame on the workhouse. Ward died of horrific burns after playing with a lighted piece of paper. A coroner's jury recommended that the fireguard in the children's quarters be moved further back from the fire and that children be better supervised. The union also got into trouble for not reporting the incident to the Local Government Board who first learned of the matter in an article from the Birmingham Daily Post. In 1884, a large new infirmary was built at the west of the site to the rear of the workhouse. It had a central administrative block containing a dispensary, nurses' room, receiving room, and linen store. Pavilion blocks for males to the north and females to the south were connected by corridors to the administration block. Later additions to the site included Public Assistance buildings during the 1930s, and ward huts erected in 1939 as part of the Emergency Medical Scheme. The former Bromsgrove workhouse later became All Saints Hospital. Only the entrance block survives, now converted to office accommodation. 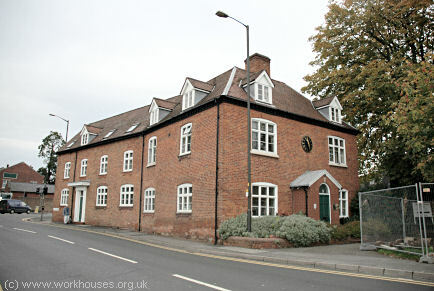 The Bromsgrove Union established children's cottage homes at 150 Stourbridge Road, Bromsgrove. In 1924, they could accommodate 30 children and the Superintendent was A.C.H. Cornell. The home was later taken over by the Worcestershire County Council and became the Grove children's home. The building has now been converted to flats. 1881 Census - Bromsgrove workhouse. Worcestershire Archive and Archaeology Service, The Hive, Sawmill Walk, The Butts, Worcester, WR1 3PB. Few records survive — holdings include: Guardians' minute books (1836-1930); Financial statement (1847-75); etc. Victorian Workhouse: A Study of the Bromsgrove Union Workhouse 1836-1901 by Neville Land (Brewin Books, 1990).